This piece originally ran on January 26, 2016. 2. A repairman is set to arrive at 8:00 AM on Monday. He won’t know how long the job will take until he’s had a look, but he estimates three days, five at the most. On Monday he texts to say he’ll start on Tuesday, but he’s confident he’ll be done by the weekend. Tuesday: repeat. 3. Pete the repairman shows up on Wednesday, deems the bathroom floor to be damaged and pulls up the tiles. Now he just has to put down new tiles. Easy! Then Pete calls you from the tile shop: do you want different tiles? The insurance covers like-for-like replacement, but if you want something different you can just pay the excess. Oh! Pete needs to know right away. That’s fine — this is the moment design-Instagram has prepared you for. You know exactly what you want, and feel like you’ve really got a great deal here. 6. To everybody’s surprise, the insurer decides to to cover like-for-like replacement of the wall tiles. So, says Pete, do you want different tiles? You know the drill; you’re practically a design blogger by now! Pete spends the rest of the week removing the old tile and preparing the walls, leaving your entire flat covered in a fine layer of plaster dust. It gets everywhere, including inside the kitchen cupboards. 7. On Saturday morning, you get up early as Pete has arranged for a weekend tiler. Let’s get this done! he says. You feel encouraged until Pete calls: The tiler isn’t coming because he broke his ankle last night. You attempt to feel sorry for him. A second weekend is spent tiptoeing around on a chipboard bathroom floor. You have to crouch down in the tub as you wash, as not to splash the bare walls. 8. Brian is back. Your bathroom has now become a nuisance for him as he has places to be. No one expected it to last this long, Brian informs you, while you make him a cup of tea after first checking the mug for plaster dust. The feeling of getting a bargain has well and truly evaporated, but both Pete and Brian seem confident it will be done by Friday. 9. On Tuesday morning, Brian calls in a fluster. There’s a leak! It seems all the jostling around has cause the original leak — the one that triggered all this, remember? — to reemerge. Or maybe it wasn’t fixed properly in the first place. All that’s certain is that a plumber is needed before they can proceed, and also, a section of drywall needs replacing. Work stops for 48 hours as the insurance company considers who will pay for all this. 10. Thursday rolls around, and you tell Pete to go ahead. You’re ready to throw money at the problem. Pete says he understands. He finds someone to fix the leak and repair the wall. They’ll be over Sunday morning! Great. 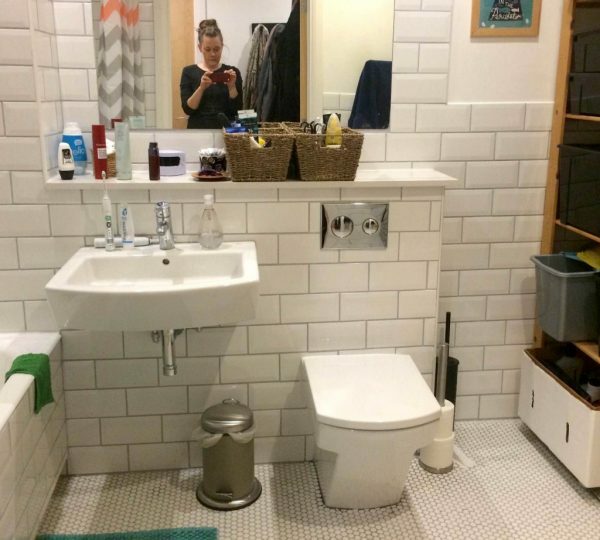 You spend your third weekend in a stripped down bathroom, crouching down to shower still, now with the added challenge of trying to flush the toilet at little as possible as not to aggravate the water damage. You travel the London Underground, where each station is covered in colourful, sprawling tiles, and you feel like they’re mocking you. 11. Alan the plumber was a little too gleeful when he told you that having a repair last four weeks is nothing — sometimes these jobs go on for months and months because they just can’t locate the source of a leak. Imagine! Mere hours later, you realise there’s still the tiniest leak, and now, the toilet doesn’t flush properly. Someone will be round to fix it and finish the job, tiling and all, says Pete, bright and early on Wednesday. This is a low, you think to yourself as you spend the next three days with what can reasonably be called substandard plumbing. Your place has slowly turned into a tip and there’s building dust everywhere, but there’s no point cleaning until the work is done. You consider checking into a hotel, but you can’t chance it — you have no idea how much all this will cost you. 12. On Wednesday, a fellow named John arrives and says he’s going to stay until the job is done, which means he’ll be working the weekend. You nod feebly. You’re starting to accept this situation as your life now. You no longer have any feelings about any of it: not about your bathroom, the lost weekends, the mess that is your flat, or indeed the certainty that the arrow of time only moves in one direction. But John fixes the toilet flush, and tiles the shower so you can wash without worrying about damaging the walls for the first time in weeks. In spite of yourself, you feel a spark of hope, but only for a moment: John can’t make it on Friday due to a veterinary emergency. You make sympathetic noises, but it’s all an act. 13. Good old Pete comes to fix that tiny leak. He can’t work out exactly what the problem is so you authorise a full replacement. It’s not cheap, but the thought that money could save you from this is sweet relief. John returns the next day and claims he’ll be done by Sunday night. You know better than to believe a word of it. 14. John is back bright and early Monday morning. Of course he is. Yesterday he told you that whenever builders say five days you have to allow seven, which is not your idea of good expectation-management. But the tiles are in place! 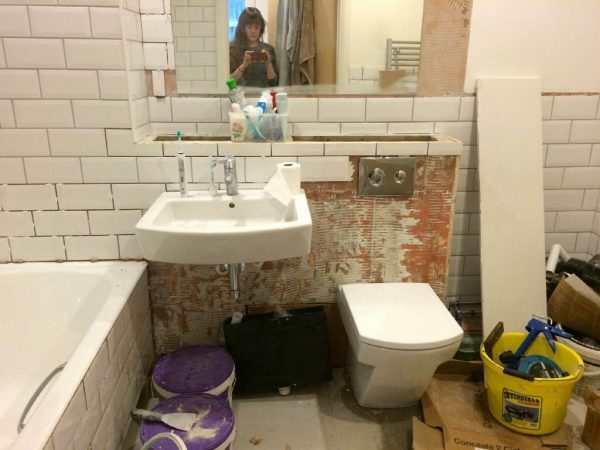 Pete has arranged for someone to come and finish up the last bits, including shortening your bathroom door, which apparently is a thing that needs doing. That’s not happening until Thursday though. Deflated, you go to pour yourself a drink, only to discover that John has finished your good booze. 16. Sam, who’s still alive, returns on Monday as promised and everything is miraculously done. You’ve never been so happy for a chance to clean in your life. The bathroom looks so good! And, you think to yourself, maybe the kitchen could do with some tile too? This time you’d do it yourself though. Hell is other people. And you’re determined! Pete, Brian, Alan, John and Sam have nothing on you. Jessica Furseth is a freelance journalist in London. 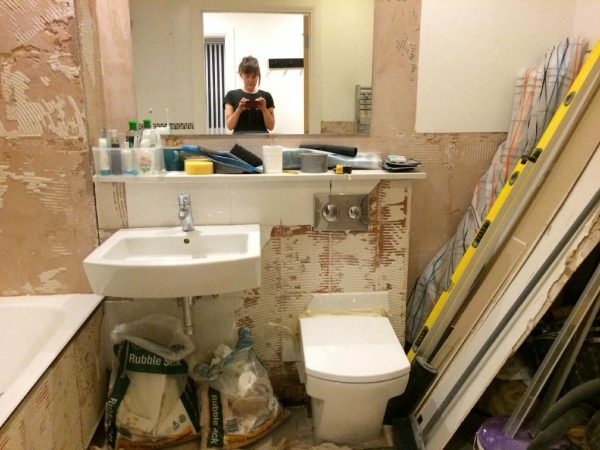 She’s on Twitter and Tumblr, and she’s never moving house again.